Joseph Francis Ambrose (May 24, 1896 – May 1, 1988) was a U.S. World War I veteran who served in Company I, 140th Infantry, 35th Division, of the American Expeditionary Forces from 1917 to 1919, becoming nationally known for his 1982 photo at the dedication day parade for the Vietnam Veterans Memorial In this widely viewed and circulated United States Defense Audiovisual Agency photo, he was photographed wearing his 'Doughboy' uniform, helmet, and field equipment. 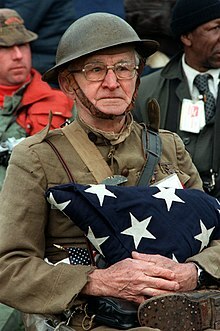 In the photo, Ambrose clutches the American flag that had covered the casket of his son, Clement A. Ambrose, who was killed in Korea on Valentine's Day, 1951. Joseph Francis Ambrose was born May 24, 1896 in Joliet, Illinois. His father and mother were Austrian, and lived in a community of many German and Austrian immigrants. His father worked at a steel mill until the age of 63. Ambrose had one sister, Anna, who lived from 1900 to 1955. Ambrose was drafted in 1917, and served in the United States Army until 1919. Prior to World War I, he was a laborer at the "Phoenix Horse Shoe Company." After the War, in 1920, Ambrose lived with his father and sister, and was working as a "Heater" at a "Gas Company." Sometime in the mid 1920s, he married a woman named Marie. Her native language was Croatian, but she also spoke English. She was born in 1904, and immigrated to the U.S. in 1907 from Austria-Hungary. They had four sons: Joseph Jr. (1926), Norbert (1927), Clement (1928), and Rolland (1933). In 1930, Ambrose worked in the tile business and in 1942, on his World War II draft registration card, he listed "E. I. Du Pont Construction" as his employer. Ambrose's third son Clement A. Ambrose (1928–1951) was serving as a Sergeant in the 7th Infantry Regiment, 3rd Infantry Division, when he was killed in action on February 14, 1951, in the Korean War, at the age of 22. Sergeant Ambrose is buried in the Saint Johns Cemetery, in Joliet, IL. Sergeant Ambrose was awarded the Purple Heart, the Combat Infantryman's Badge, the Korean Service Medal, the United Nations Service Medal, the National Defense Service Medal, the Korean Presidential Unit Citation, and the Republic of Korea War Service Medal. Some sources indicate that Clement Ambrose also reportedly served in the Merchant Marines during World War II, in the Philippines. His gravestone reads: "Our son S/Sgt. Clement A. Ambrose gave his life on the battlefield of [Korea." Ambrose's wife, Marie, died in 1980, at the age of 76. He died on May 1, 1988, less than a month before his 92nd birthday. The Joliet Public Library lists his obituary in the 1988 Obituary Index: "Ambrose, Joseph F. Sr. "Doughboy Joe." Joseph Ambrose wore his old Army 'doughboy' uniform and carried his son’s flag often to Veterans Day parades and VFW conventions. He confessed that some years he had to go on a crash diet to squeeze back into it. But he did it to honor the veterans of the Korean and the Vietnam wars, wars he believed America was trying then to forget. He wanted to remind us of an important truth: that no matter the outcome of a war, those who answer the call of duty and risk everything to defend America deserve the respect of a grateful nation. ^ "Veterans Day photo". Wikipedia. Wikimedia. Retrieved November 12, 2015. ^ Hermann, Andrew (June 13, 1986). "A V-Day for Viet veterans". Chicago Sun-Times. Archived from the original on February 20, 2016. Retrieved November 12, 2015. ^ a b "World War I Draft Registration Card". Retrieved November 12, 2015 – via FamilySearch. ^ a b "1920 United States Federal Census". United States Census Bureau. Retrieved November 12, 2015 – via Ancestry.com. ^ "1940 United States Federal Census". United States Census Bureau. Retrieved November 12, 2015 – via Ancestry.com. ^ "World War II Draft Registration Card". Retrieved November 12, 2015 – via FamilySearch. ^ "Joliet Public Library 1988 Obituary Index". Joliet Public Library, Illinois. Retrieved November 12, 2015. ^ "Congress Should Honor Veterans By Passing Bipartisan Legislation To Create Jobs For Veterans And Improve Mental Health Service". United States Senate. Retrieved November 12, 2015.